Jan 22, 2015: The convergent programming concepts we created during the first dot-com wave have yet to be fully realised. These concepts can serve as learning vehicles for current cross-platform creators. 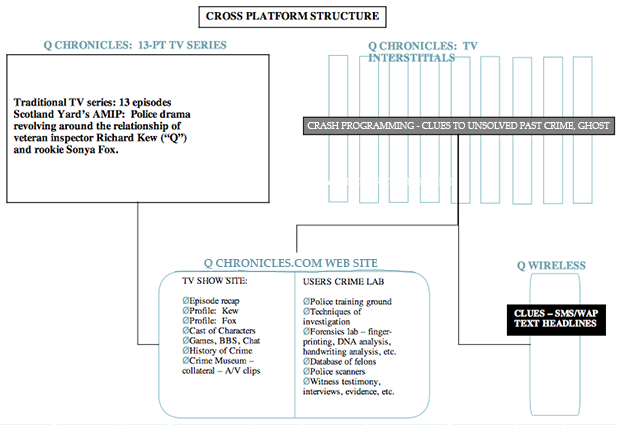 In 2000, I devised the “Q Chronicles,” a cross-platform format that wove together a TV show, interstitials, website and mobile devices. The William Morris Agency in London jumped on the “Q Chronicles” cross-platform story engine as a blueprint for key-in-lock (mysteries, detective, science fiction, etc.) programming. But TV producers shied away. The technology to execute was still crude and costly. With the widespread adoption of broadband and the rise of web video, complex convergent programming may emerge in today’s media universe. This article will unfold in two parts: 1) Q Chronicles Cross-Platform Story Engine and 2) Extending Narrative and Zuiker’s Level 26, the Digi-Novel. Kew suffers from dementia due to Alzheimer’s disease and must (eventually) resign from Scotland Yard. Fox is slated to move into Kew’s cubbyhole. Initially, Kew battles with Fox – a young/old, man/woman conflict. Over time, Fox gains the trust and respect of the old inspector. A father-daughter relationship forms as they team up to solve homicides. When Kew’s mind begins to disintegrate, Fox delves into Kew’s chronicles to learn the techniques that made Kew a star inspector. In the final episode, Kew dies. Now operating solo, Fox must apply Kew’s techniques to catch a serial killer in present-day London. Q Chronicles spanned four platforms – TV, website, mobile devices and interstitials. 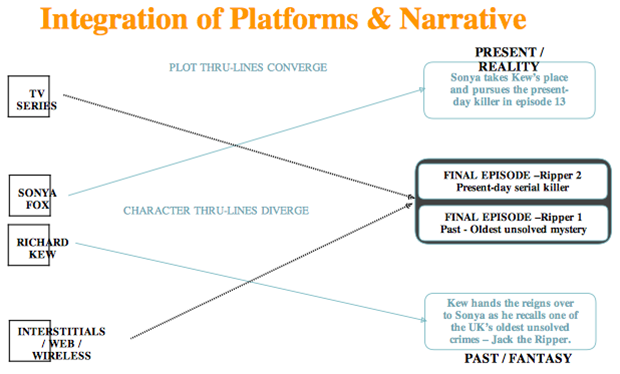 While the 13-episode TV show functioned as a traditional detective show – solve a new crime per episode – the other platforms extended the story world in different ways. In 2000, we were interested in TV interstitials as a form of crash programming. How to integrate or coordinate the interstitials with the TV format was the question. Today, audiences are used to watching short videos online. This type of crash (short-form) programming becomes even more relevant for cross-platform creators. We wanted the Q Chronicles website to reach beyond TV show info. By creating an online crime lab, users could step into a rookie cop’s shoes. While Sonya Fox learned the tools of the trade, the audience followed in her footsteps in the virtual world. We understood that the TV show had to exist as a standalone. Audiences who were neither wired nor inclined to use digital devices and the Internet had to be able to watch the show without missing any plot points. So, we gave Fox a ghost – her mother’s unsolved murder. This ghost also motivated Fox to step through the doors of Metropolitan Police in the first place. As Fox became a more able detective, she began to recover memories of her mother’s murder. THIS PAST UNSOLVED CRIME WAS THE PARALLEL STORY TOLD IN FRAGMENTS VIA INTERSTITIALS. WHILE THE TV SHOW WAS A PROCEDURAL, THE INTERSTITIALS WERE EPISODIC AND OPEN-ENDED. We mashed two types of programming up against each other. Hearken back to the “X-Files” in which Chris Carter interwove an episodic conspiracy with a monster-of-the-week procedural. The short-form programming became a striking way to deliver clues and allowed an audience to peek into Fox’s mind. As she put the jigsaw together in her head, so did the audience. Characters, props and events could be introduced in the interstitials and then interwoven into the TV series. For example, a newscaster introduced in an interstitial could become a character in a TV episode. The integration of story elements from intersitials into the main show accelerated. The show’s 13th and final episode acted as a kind of vortex. In 2000, convergence was the buzz word. We aimed to not only sync the platforms for the delivery of content but also bring the narrative threads together. In the Q Chronicles, the serial killer in the final episode had to be either a mirror of or the same criminal who murdered Fox’s mother. As a skilled inspector, Fox now had the strength to face her worst nightmare. Meanwhile, the participating audience enjoyed the pay-off of helping to catch the most devious criminal of the series. In part 2, we’ll explore how world began to embrace microstories as a technique to extend the story world. By 2009, people were not only defining this technique in literature but also implementing it.